This classic dress reminds us of Audrey Hepburn! 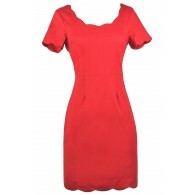 You’ll be effortlessly stunning in this gorgeous sheath dress. The Audrey Cut-Out Sheath Dress is fully lined. It is made of a beautiful chic textured fabric and has a sheath fit. The scooped neckline is decorated with a detachable silver rhinestone necklace. This necklace is absolutely stunning! The dress has capsleeves and a unique cut-out back. A hidden back zipper completes this dress. We love that you can create two different looks by wearing or removing the necklace. This dress will add instant chicness to your wardrobe! Pair with heels and a simple jewelry. Details: Fully lined. Hidden back zipper. Detachable necklace. 97% polyester, 3% spandex. Lining: 100% polyester. Hand wash cold. Do not bleach. Hang or flat dry. Low iron. Small measurements: Length from shoulder to hemline: 33”. Bust: 32”. You have added Audrey Cut-Out Back Sheath Dress in Black into Wishlist. You have added Audrey Cut-Out Back Sheath Dress in Black for Stock Notification. You have set Audrey Cut-Out Back Sheath Dress in Black as a loved product. 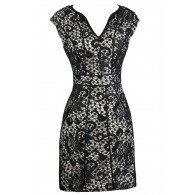 You have removed Audrey Cut-Out Back Sheath Dress in Black as a loved product.